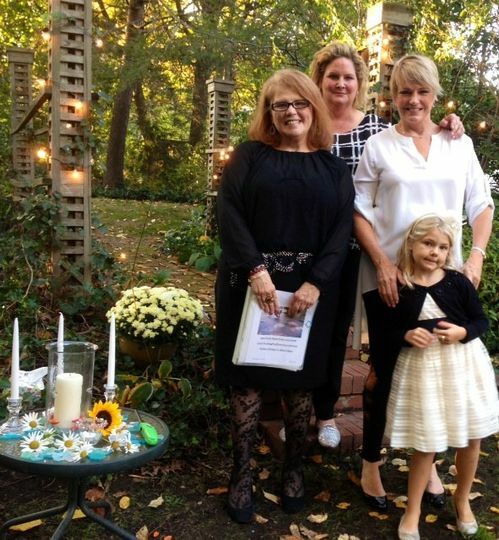 I became a celebrant/officiant because life cycle events are the truly magic moments that make the DASH worth it. Not familiar with the DASH, you say? Yes, you are, trust me. Here it is: BORN DASH DONE as in 1978 - ? See what I mean? So your opportunity to honor each of the many important choices we make in our lifetimes is where I come in, with your choice to marry being on the top of the list of life's incredible transitional events. It's a big and bold step that takes you into the next part of your journey in your life now sharing it with someone and you have invited your family and your friends and sometimes your pets to be there to witness it. 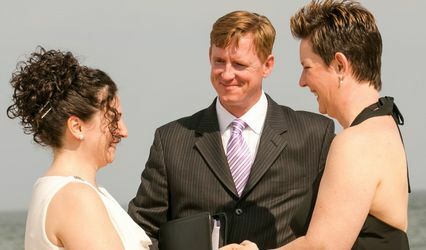 Having me as your celebrant will insure that your vision of yourselves as a couple, as a family, as people is well represented in the most honest, fun and heartfelt way possible to make your celebration one that is warm, special and unique to who you are. My background as a Public Relations practitioner with experiences that have taken me from the Grammy's to the Oscars and everything in between informs my work as a celebrant. My path to becoming a celebrant became clear and dear to me when I realized that I could combine my love of people, creating a great story and my attraction to all things spiritual. 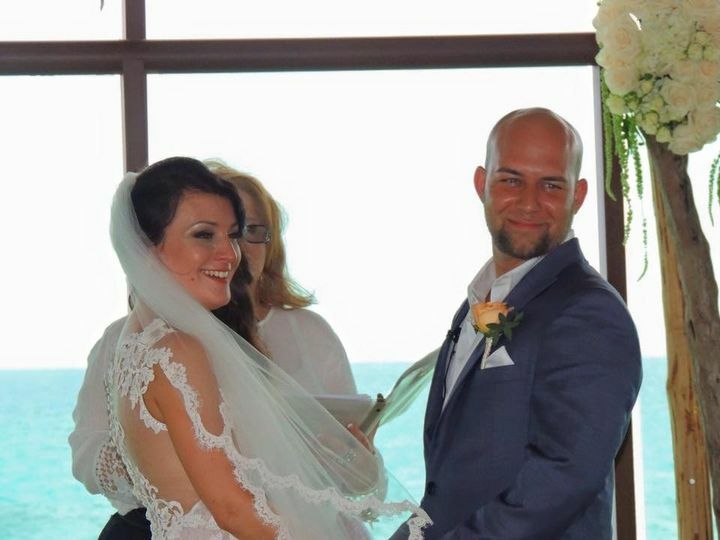 While I am not clergy, I am trained to honor the divine by recognizing the importance of each couple's journey and how to bring that forward in your ceremony. 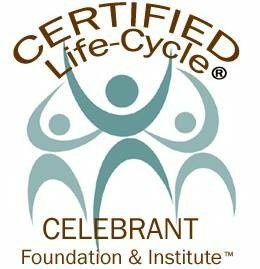 I am honored to have gotten my degree from the Celebrant Institute and Foundation (www.celebrantinstitute.org) as a certified Life Cycle Celebrant in 2012 and since that time have conducted weddings, namings, and other lifecycle events. I proudly marry and support LGBTQ, multicultural and multi religion couples in their quest to tie the knot. In the end, as a great poet wrote, "It's not the breaths we take, but the moments that take our breath away." Make your celebration one of those times that does just that: takes your breath away with joy, happiness and love. 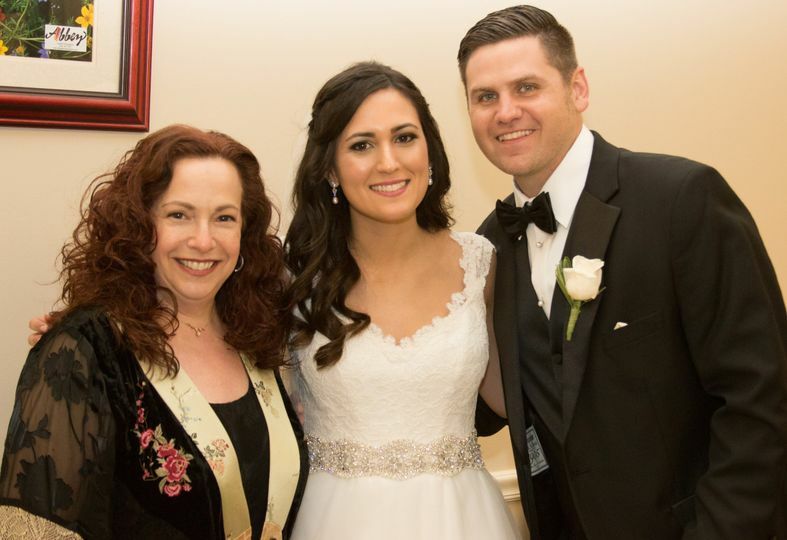 The wedding of Sarah and Tom, Saturday, April 9, 2016 Such a lovely, loving and beautiful twosome! Happy Couple in an unscripted beautiful moment of devotion and love. 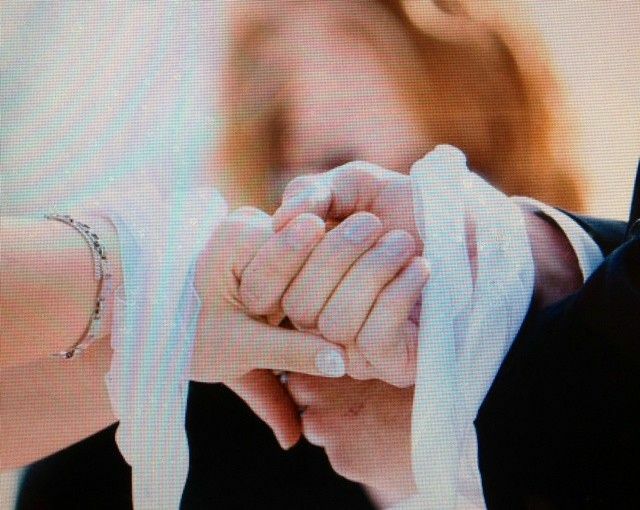 Handfasting, a lovely ritual of love and commitment. email me for how it is done! 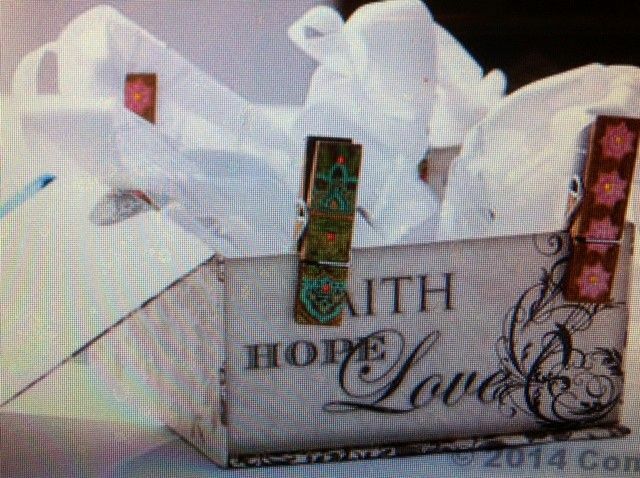 the box holding the handfasting cord. Ellyn was exactly what we were looking for. Her presentation was amazing and it had the perfect blend of seriousness, laughter, love, and fun. We aren’t super religious but wanted a few small things sprinkled in, what we were looking for was the perfect mix of light and serious, Ellyn accomplished this for us perfectly. Our first encounter with Ellyn she met us at any location of our choosing where we told her our story in person and right away she came off very personable. After that she sent us a very detailed questionnaire that she had each of us answer individually. These answers helped give her everything she needed for her speech. 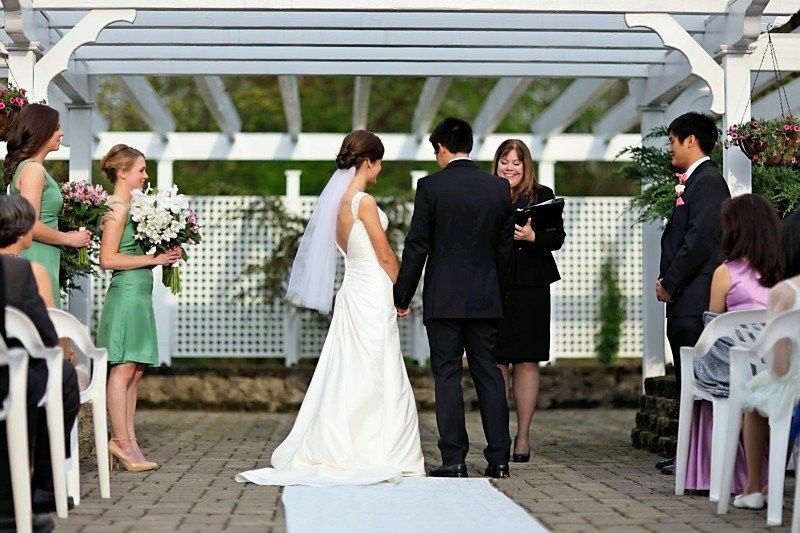 Using these answers Ellyn created the most beautiful speech we could have ever asked for. She went over our entire relationship history while including all religious things we had requested. She also made sure we read the entire speech in advanced and gave it the thumbs up before going forward. Her goal was to satisfy everybody. 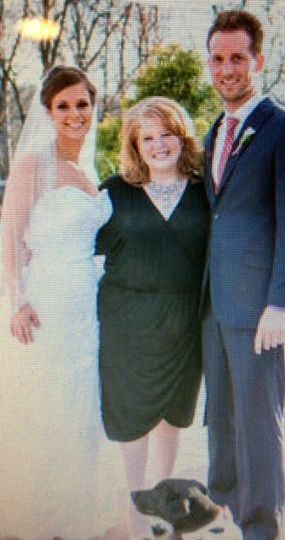 Everybody still tells us how much they loved our ceremony and it is because of Ellyn. 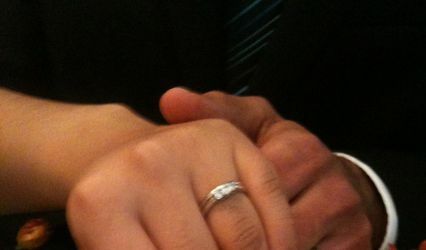 It was funny yet serious, laughing with smiling, loving and happyiness, and we couldn’t have dreamt a better situation. Ellyn was amazing! She tailored our ceremony perfectly and really got the vibe we were looking for. Our guests raved and my husband and I were so thrilled. Thank you Ellyn! Thank you both so much for the kind words. 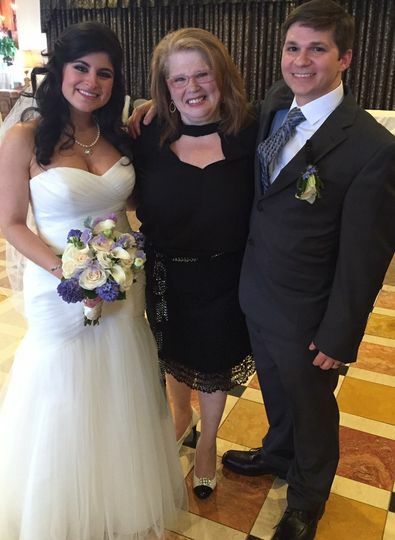 It was a lot of fun officiating your ceremony, you are a very special couple and family. Also, your dress was FABULOUS! (lol) All love to all of you! 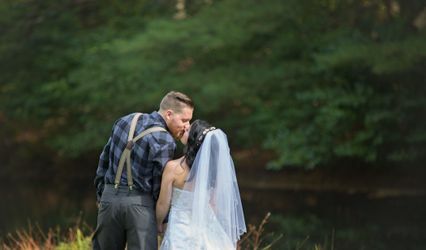 I cannot recommend Ellyn more than any vendor at my wedding -- she was AMAZING!! 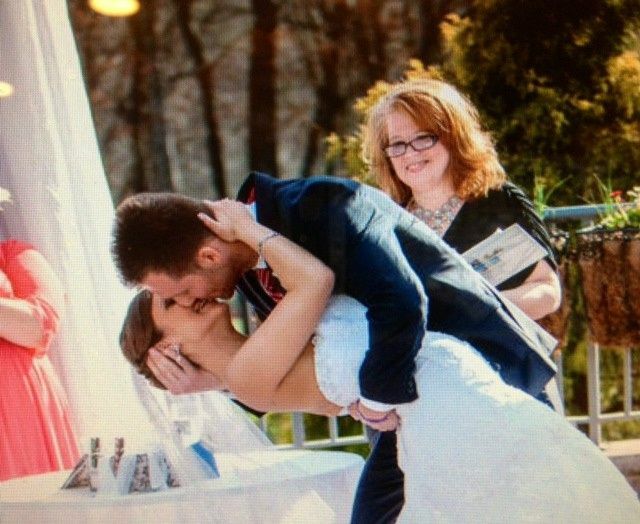 By far the most memorable experience for all guests at our wedding. 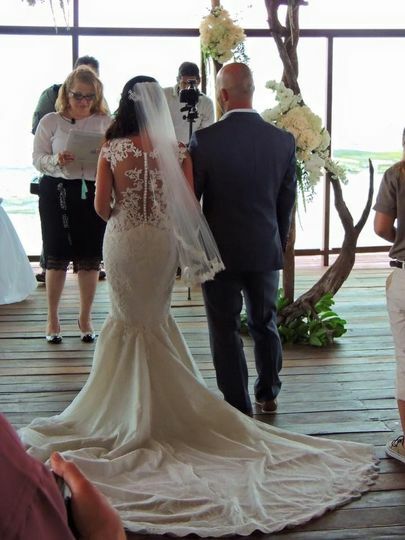 My husband & I had a unique story of meeting abroad, and Ellyn tied together all the details in such a way that our families from different countries could understand how we fell in love abroad. People were tearing up! She also spoke in an eloquent way that was very easy to understand for everyone at the ceremony. She was honestly the highlight of our day... Thank you Ellyn for everything!!! Thank you so much for these words from your heart. Your story was inspirational and stands as an example to how even when we come from very separate parts of the world, we have so much more in common than we realize. You and Khaled really touched my heart. Wishing you safe world travels and tons of love! Ellen is grace under pressure. A true professional, I highly recommend. Ellyn is an amazing writer, ritual creator and Celebrant.